Special thanks to content contributors Aurea Astro and Mike McMeekin. The Bing Ads team is always thinking about how to improve your experience with our product and services. One way is providing insight and transparency into our systems, since knowing context can help inform day-to-day decisions. In this spirit, we would like to explain just how our Ad Auction works (if you'd like to download a PDF version of this post for future reference, you can do so here). Every time someone performs a search on the Yahoo! Bing Network, we run an auction – an online market not unlike a real auction – to determine which ads are shown and where they are placed on the page. Advertisers compete in this auction by bidding on keywords that match their product or service to the search, and win an opportunity to display their advertisement on the search results page, as illustrated above. The price the advertiser pays every time someone clicks on his or her ad (CPC, or Cost-Per-Click) is also determined here in the auction. What kinds of factors dictate where and when your ad lands, and how do they interact? Let’s begin with Quality Score (QS). Most advertisers are familiar with the QS displayed in Bing Ads Web UI and API. It is a reporting metric that indicates how well the ad is performing relative to expectations and competition. 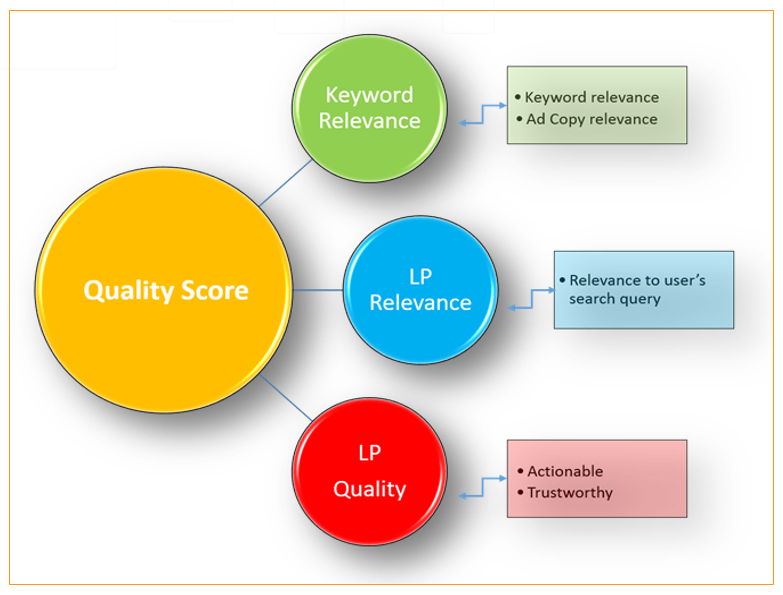 Quality Score in this form serves as guidance for advertisers on how to improve their ad to increase traffic and revenue. However, it is not the same metric used for ranking and pricing in the ad auction. The complex mechanism by which QS is determined in the auction enables us to reconcile the motivation between searchers and advertisers to benefit each. The principal behind QS is the same regardless of the context in which it is applied– namely, to help advertisers gauge the degree by which their ad satisfies the intent of a search query. The ad auction looks keenly at the quality of the advertisement (indicated by measures of its relevancy outlined here) to ensure that the right ads are shown to the right users, rather than just the ad of the highest bidder. For example, if a user types “Las Vegas Hotels” into Bing, it is highly unlikely we will show an ad for “New York Flights” because of its low relevance to search intent, despite the fact that its advertiser may have the highest bid. Showing only the most relevant advertisements ensures a quality search experience on the Yahoo! Bing Network, and is our primary goal. Ad Rank is a metric we use in the auction to rank ads of varying quality and different bids. Generally speaking, we calculate Ad Rank by multiplying your bid by various scores related to your ad’s quality. Let’s use Quality Score to observe how the auction works in the example on the next page. Four advertisers, each with varying Quality Scores and bids, compete against each other for a spot on the results page. As you can see, although George has the highest bid, Jerry wins the auction and is awarded by ranking #1. Notice that because Jerry’s QS is four times higher than George’s, Jerry is able to achieve an Ad Rank twice as good (8 vs. 2). So now that we’ve seen how Quality Score and Ad Rank interact in the Ad Auction, what determines how much an advertiser actually pays every time a user clicks on his or her ad? Let’s see how much Jerry pays for a click in our example auction, using the above formula. We divide Elaine’s Ad Rank (6) by Jerry’s Ad Rank (8), and multiply that result by Jerry’s bid to get $1.50. Thus, every time someone clicks on Jerry’s ad, he is charged $1.50. First, notice that while Jerry is #1, he observes a lower CPC than Elaine and George because his QS is high. While such a scenario certainly is possible and happens frequently in fact, for the most part higher positions cost more per click because of the greater competition for them. Second, notice that if we were to raise Jerry’s bid, his CPC would not change, regardless of how high he raised it. We recommend you try it right now by going through the equation for Jerry using a $20 dollar bid instead of a $2 dollar bid to observe the pricing function in action. So now that we’ve seen how CPC is calculated, what you can do to influence it? While you may not have control over the market and your competition, there are several important factors you do have control over. Let’s look at these. As an advertiser, your bid is single-handedly the most direct and influential lever in your control to maximize ad rank and the likelihood your ad is displayed. A bid represents the maximum price an advertiser is willing to pay. However, it is very often the case that what you actually pay is lower than that amount. Ideally, the higher you bid, the higher you value the click. Bing Ads uses the auction to ensure that it maximizes clicks where advertisers value them the most. Therefore, it is generally the case that increasing your bid results in a more favorable ad position, which in turn increases the number of clicks on your ad. Along these lines, an increase in bid that does not improve ad position will not directly increase your CPC. Increase QS --> Lower CPC for the same ad position. First, you could have a high KWR score because everyone else is doing poorly in comparison; don’t assume that you cannot increase your keyword’s CTR even when your KWR or QS is high. Second, while they may be correlated, the CTR you see in your account is not the same CTR used as this metric or in the auction. CTR must be normalized for dozens of variables besides that of the advertiser’s. For instance, because two ads cannot show in the same position at the same time, we must normalize CTR performance for ad position. Normalization involves a sophisticated mathematical process, and we therefore recommend that advertisers not evaluate their ad’s performance on CTR alone. Again though, the underlying principal remains the same: the more relevant your keywords are to the words or phrases users type in when they perform a search, the higher your ad’s CTR, and the higher your QS. It isn’t enough to get a user to click on your ad; the content you ultimately deliver needs to be relevant to his/her needs. 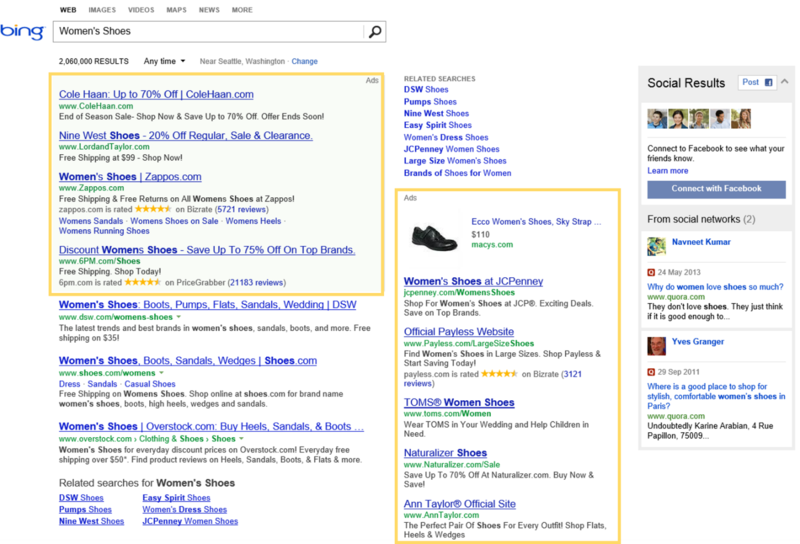 Bing Ads assigns a score to your landing page (LP), which indicates how well it meets search intent. Although an ad may have high keyword relevance (“clickability) and contain content that is relevant, it may lead the user to a site that provides a poor experience. Again, our goal is to provide search users with the best experience possible. This means displaying only relevant ads that satisfy what they’re searching for, as well as limiting their exposure to sub-par websites. As advertisers constantly optimize, your competitors bid may increase or decrease, which in turn changes their Ad Rank. In some cases this may result in ranking changes, but in many it will just influence pricing. For example, let’s return to our example auction and look at two different scenarios. If George increases his bid from $3.00 to $3.50, Jerry will observe a 17 percent increase in his CPC. Although neither Jerry nor George’s positions in the ranking changed, a significant CPC increase happens for Jerry. You may also notice that even though George increased his bid, his price remains unaffected. In general, price increases resulting from your higher bid can only happen if there are position changes. Because Bing Ads is constantly working to improve user experience and optimize the marketplace, we update our models frequently. Such updates aim to improve the quality score estimation or adjust pricing reserves, which in turn improves performance metrics (like pricing) for individual advertisers, as well as the search experience for users. Context matters, and we hope pulling back the curtain on how the Ad Auction works will better inform your search marketing strategy going forward. We invite your feedback and suggestions for additional insight into Bing Ads that you feel would help you maximize your performance on the Yahoo! Bing Network. Landing page relevance, user engagement with your ad and site, index of keyword relevance comparisons, and more interact in a detailed, data-driven mechanism that determines QS in the ad auction. The dynamic nature of QS as a living, breathing metric that incorporates relative values in the market may produce unexpected results from time to time for an advertiser only familiar with the factors of QS that he/she can control. Across the industry, QS is the product of relevant values between all the players in an ad auction. So, for example, if you improve your QS without changing your bid, and your CPC rises, it is most likely that the average QS amongst your competitors also rose. Your CPC is relative to not only your QS, but the QS of those around you. (6/8) * $2.00 = $1.50. Interstitials or processes by which users are forced to enter personal information before they can move forward are typically considered sub-par, even if the page content is relevant. We update data in the model frequently, not the algorithm itself. The result of these updates is a more accurate Quality Score for advertisers.